Every spring I hafta make this coffee cake and this is not just any old coffee cake, it’s my Rhubarb Coffee Cake with a Vanilla Streusel and to top it all off, a Vanilla Sauce. Did you get all that? It’s a one, two, three punch of sweet tart goodness. This Rhubarb Streusel Coffee Cake with Vanilla Sauce is just full of tart rhubarb goodness and chopped finely, the rhubarb all but melts into the cake. The streusel topping makes a thin, shiny crispy layer across the top, although that does soften with storage, so it’s at it’s very best the same day. And the vanilla sauce? At first glance, you might suspect it could be a bit bland but trust me, it’s not. It’s almost like a melty candy. This is just a medley of goodness. This recipe came out of a big old Bed & Breakfast cookbook I picked up back in the 90’s. Picture yourself back in time now, sitting on wicker chairs on the white washed porch of some big old Victorian mansion, Boston ferns waving in the breeze and slice of this! A few of our family favorites have come from this Bed & Breakfast book, Kaltenbach Farms Sloppy Joes, for one & Potato Cheese Breakfast Bake for another. This one is from the Inn at Sea Street in Hyannis, Cape Cod, Maryland. Now, I’m not gonna lie. This is NOT one of the prettiest coffee cakes in the pan, but plated and drizzled with the sauce, you’ll see just how useful all those little dents in the top are. They hold some of the sauce as the rest pools. This is just the thing to serve for family casual company that stops by. 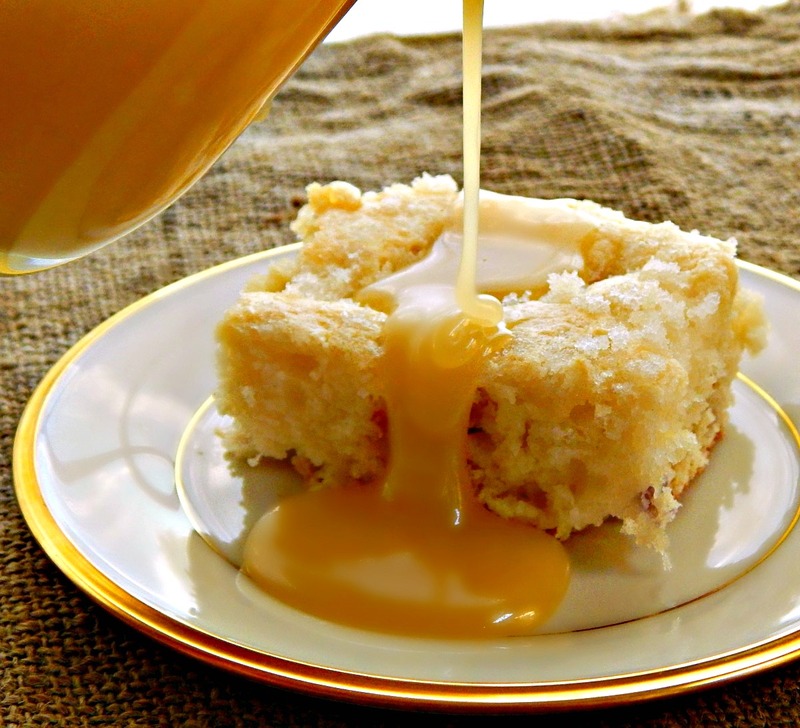 The sauce can easily be made ahead and the cake is super simple. No mixer needed. (It would be perfect for a budding baker.) I thought this would be a great recipe to show off my “Miracle Goop“; a homemade quick release mixture for cakes. It works very well on this cake, which has a tendency to be a little sticky. I made this today in a 9 x 13″ pan but if you’d like a higher cake, try a 9 x 9” pan. Preheat the oven to 350 degrees. Grease and flour (or use my “Goop”) on a 9 by 13″ or 9-inch square baking dish and set aside. In a large mixing bowl, add melted butter, sugar, egg and buttermilk. Whisk together. In a smaller bowl, whisk together the flour, baking powder, baking soda and salt. Add the dry ingredients to the butter/sugar mixture, and beat until just moistened. A few small lumps are fine. Fold in the chopped rhubarb. Pour and spread the batter into the prepared pan. In a small bowl, combine the butter and sugar for the topping. Sprinkle evenly over the batter. Bake for 30-45 minutes or until a toothpick comes out clean and the top of the cake is lightly browned. For the sauce, melt butter in a medium saucepan. Add the sugar and evaporated milk or cream. Bring to a boil; cook and stir for 1 minute; it will slightly thicken. Remove from heat and stir in vanilla. The sauce will continue to thicken as it cools, rewarm slightly to serve. Note on rhubarb: When I bake this in a 9 x 13″ pan, I generally use the smaller amount of rhubarb; it helps the cake hold together better. When baking in a smaller pan, use the larger amount. note: This streusel forms a gorgeous, slightly crispy layer but softens by the next day. We like it best regardless, but for a more classic streusel, increase butter to 4 tablespoons and add 1/2 cup of flour. This entry was posted in Click here for Fabulous Food Posts and tagged Cake, coffee cake, Dessert Sauces, Desserts, Freezes Well, Frugal Hausfrau, rhubarb, rhubarb coffee cake, streusel. Bookmark the permalink. Grow my own rhubarb, nice to try something new! lol! Well, I lost some…but yes, he should make himself more available, lol! Actually, he should have taken me with him!! Absolutely! And thanks for the comment. That sounds amazing. I love rhubarb and streusel on anything! I need to go “borrow” some rhubarb from my parents’ plant ASAP. This looks absolutely luscious! Thanks Rhonda! I do have a trove of recipes over the years that I love. 🙂 I think some of them are the best. Thanks for a great and timely idea on how to use some of my rhubarb which is just now ready to pick. I get so excited, Hilda, when it’s rhubarb time! I actually use rhubarb all summer long, but it’s so great when it appears in spring, before anything else! Ooooh, fudgy chocolate sauce!! This cake would be good with all kinds of things, too. Maybe cherries or cranberries?! You sure dredged up a winner to re-shoot! Look at all that crazy goodness going on in there! Thanks! I hate to repost because it makes the old post go away and you get one of those 404 errors, but the pics were so bad no one ever looked at it! There’s still some on the counter and I am trying not to think about it!! This one is going on Pinterest-oh ya, baby! This looks beautiful! Almost bread pudding-y. Quite a bit fluffier, but as I looked at the photos with that sauce, it reminded me of a post for my raspberry white chocolate bread pudding! Now that’s another fave!! Thanks, Dianna. It’s really a fave of mine and was a big hit with my folks, too. Wow, I’ve never heard of putting rhubarb and coffee together, but I might have to try it because this cake looks gorgeous! Thanks much! The actual coffee is served on the side, the cake is really just rhubarb and vanilla. Wow, thanks, Dini! I’ve enjoyed it all! Happy FF to you = it’s almost over! Thanks, Jhuls – it’s my first time hosting and I’m having so much fun visiting bloggers I haven’t “met” before! Only now, I am faced with so many hard decisions! It’s a fun, easy coffee cake, by the way. i love the combo vanilla&rhubarb.I would try to make it, but here is not so easy to find rhubarb every time of the year. Love the sauce you made. That is a shame! It’s said that housewives had to smuggle seeds across the prairies because when they went on the wagon trains they were very strict about what could and couldn’t be brought because they had to keep the weight down. It’s very common all across the northern part of the US. I do chop it up and freeze it. wowee!! this recipe looks absolutely fantastic 🙂 I love the combo of rhubarb and vanilla… perfect! Thanks! It’s also unbelievably easy! I always feel like a big cheater when I make it! I’m always on the lookout for new and scrumptious recipes for said veg and I shall definitely have to add this one to my roster! Thanks Dale! I’m a little jealous! I have a puny plant, it’s just been shaded over the years. Of course it seems the more you pick, the more it grows! One year my husband ran through my rhubarb with a rototiller (the big machine)! I wanted to kill him except the following year I had 3 times as much! it’s funny you mentioned that! I actually did decide to remove it a couple years ago because it was doing so poorly – the next year it sprang up considerably bigger! Guess some need to be abused before they produce! Oh my, Mollie! This is one irresistible cake. The only thing that could make it even more perfect is having it right on the porch of that Cape Cod Inn! I hope you acquired that cookbook after staying there yourself! I only wish! I haven’t traveled to the east much – it’s one of my dreams just to take a month or two and travel back to where my ancestors settled. The times I’ve been back east were just too hurried! This looks just too good to be true – Hausfrau, you’ve made me drool again! Thanks Ginger – I probably should have noted that the photo looks more yellow than it should! The sun is low this time of year and doesn’t clear the massive amount of trees – everything is yellow/green! I need to learn how to adjust light balance! I know how you feel – overtime you’ve figured out one thing, another crops up! Thanks Sandhya! They’re actually more like big bushes with stalks – the plants can live for decades and decades! Oh wow! So they are perennials !Do they grow in cold weather too? They flourish in areas where there are hot summers and cold winters, although there are certain varieties that can be nursed along in the South. Once the winter freeze it all wilts and then regrows the next spring, one of the first things that comes up with the warm weather. Rhubarb takes a couple years to get large enough to produce but then seems to thrive on neglect and lives for decades! And that’s about everything I know, lol! Thank you so much! I learned a lot. I will now look for rhubarbs in New England! I’ve only ever had strawberry streusel pie never rhubarb on its own. I wonder how peaches would taste in this lovely looking coffee cake. I’ve been fighting off a miserable sore throat and fever so I’m just throwing together basic meals this past week but, in a couple of weeks, when work ends for the summer and I get my energy back, I hope to try a few more challenging meals and dishes. Poor thing! Summer colds are the worst! Tell me about it. The fever and groginess are misery making. I wanted to show you a plum coffeecake I last made with a streusel topping (pre-blog) but kept forgetting to do so. Fantastic! I love just a touch of cardamon – but I have to say I didn’t when I was younger. The first time I tried it I was like, ewww! Either my tastebuds have worn down or my tastes have improved! I think tastes really change as you get older. I now like fresh coriander leaves but I STILL hate raw tomatoes. That’s why I try things again over the years. Just in case. Wow thats a fantastic cake. Love the sauce and streusel topping and of course rhubarb, delicious! Thanks, Susanne! The rhubarb is just the best! I’ve loved it since I was a kid and my brother and I would sit out in the yard and pick stalks to dip in our blue melamine sugar bowl! The original sweet/tart candy, maybe!